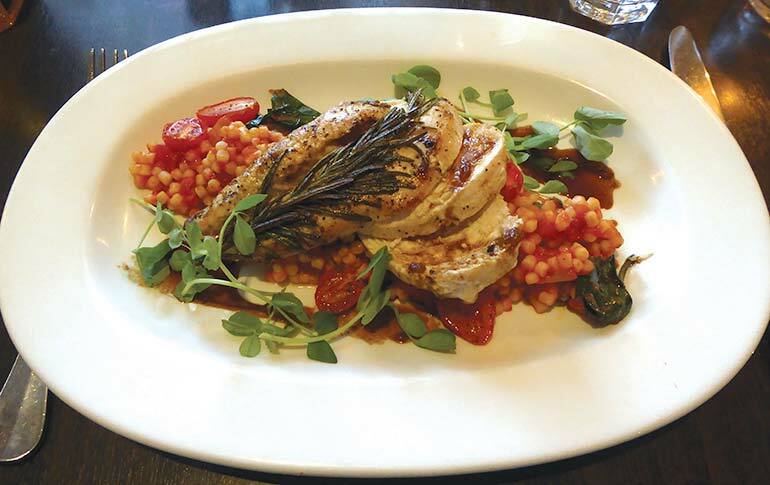 Christchurch has become somewhat of a foodies’ destination. As well as the food festival taking place this month, there’s an array of exciting places to eat. 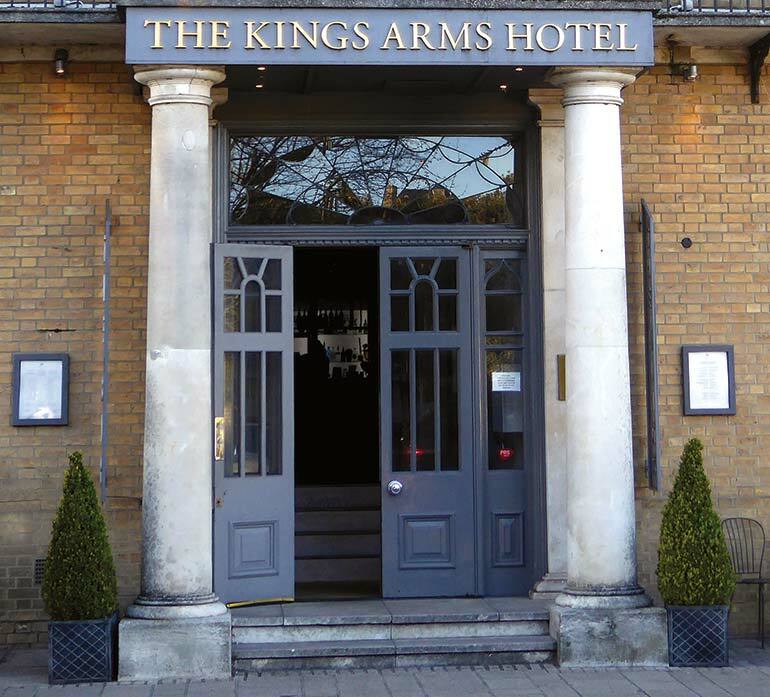 4Dorset magazine was invited to sample the delights of the Kings Arms Hotel Restaurant. I arrived with my husband on a Wednesday evening in April. We were warmly greeted by the general manager of the smart boutique hotel, Nicolas Roulier. This very tastefully decorated hotel and restaurant, owned by Harbour Hotels, is comfortable and has a pleasing atmosphere. The restaurant was awarded a Michelin Bib Gourmand in 2015. The Chef Patron is Alex Aitken. Going into the bar, we were immediately offered drinks as we pondered over the menu. While Paul sipped his refreshing G&T, the barman skilfully conjured up a non-alcoholic cocktail for me, similar to a tequila sunrise but without the alcohol. Cocktails are a speciality here and I noticed other patrons partaking and enjoying the theatre of an expert maker in action. We had been given two menus – one is called the 15-mile menu, available during the week, which relates to the majority of ingredients being sourced locally. 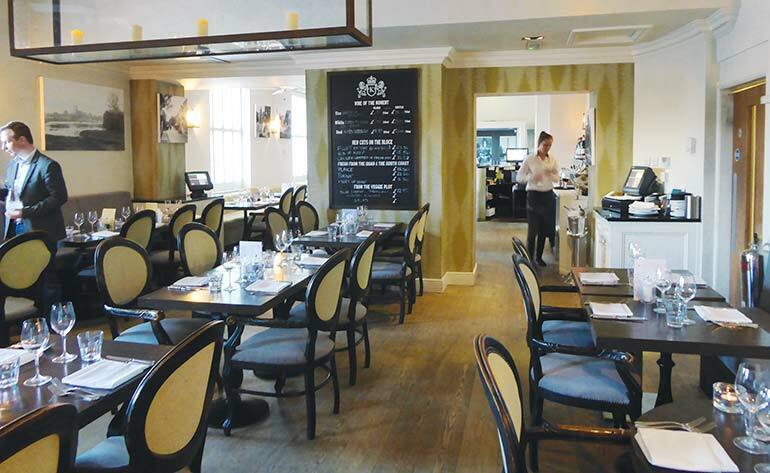 There’s a choice of two or three courses from a selection of four starters, mains and desserts. 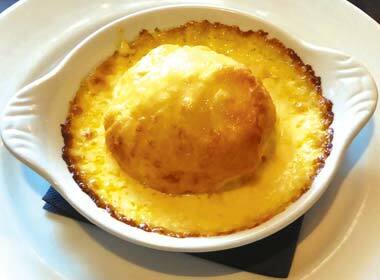 This is excellent value at £15 for two courses, or three for £20. I almost don’t want to tell you about this and keep it a secret for ourselves. We were tempted by most of the dishes listed and Paul chose twicebaked cheese soufflé, followed by Chicken breast with Fregula pasta and wilted baby spinach, and Espresso panna cotta with peanut butter brittle for dessert from this menu. Instead, I selected from the pricier à la carte; an absolute treat of a menu with a variety of nibbles, then starters, main courses with fish, meat and game, as well as vegetarian options and a separate dessert menu. There’s also a board with dishes of the day. 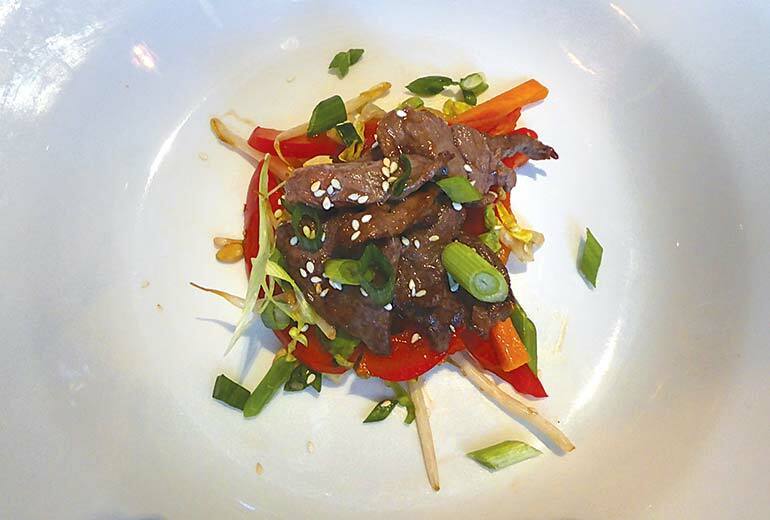 I picked a starter of Asian beef salad with strips of beef marinated in soy, served with peanuts, chilli bok choi and beansprouts, then the interesting-sounding sweetcorn risotto, crispy kale, coconut and chilli, to be rounded off by salted chocolate mousse with autumn raspberry sorbet. We moved into the restaurant for our meal. The cheese soufflé was gorgeous according to Paul and my Asian beef salad looked so pretty and tasted pretty amazing too. I noticed on the next table they had Crab Benedict, which also looked rather tempting. I made a mental note to try that on our next visit. We sipped our accompanying glasses of wine – a white South African Chenin Stellenbosch 2015 for Paul and an Argentinian red Mendoza Malbec 2016 for myself, which needed to be quite robust to stand up to the stronger flavours in my chosen dishes. Both wines were good and I thought the choice and prices of wines were very agreeable. We were also offered water. The service was efficient and our next courses soon arrived. My husband’s chicken breast was moist and perfectly cooked, the tiny pasta shapes interesting and a Sardinian-style we hadn’t come across before. It was served with a cherry tomato sauce and wilted spinach. I think Paul would have liked a bit more spinach as he is a big fan of this vegetable, but he really enjoyed it, nevertheless, and ate every morsel. My choice of sweetcorn risotto was delicious. It was seasoned well, and creamy with the addition of coconut and cooked al dente. I particularly liked the chargrilled sweetcorn cob slices and the crispy kale served on top. After a little rest it was time for our last course. 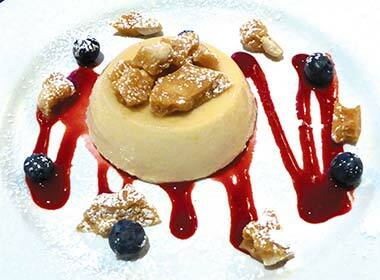 Paul’s espresso panna cotta looked beautiful. We had expected it to be dark brown and with a strong coffee hit. Instead it was subtle-tasting and pale. He really enjoyed the peanut brittle served on the side, and as I was encouraged to try a little, I can tell you it was like firm fudge with chopped peanuts. My chocolate mousse with raspberry sorbet beat me as it was rather large but was absolutely scrummy. The mousse wasn’t too rich and the sorbet complemented it well. There was a delicious aftertaste to the sorbet, which might have been rosewater. We thanked our host Nicolas for a most enjoyable meal. We had parked some way away as parking can sometimes be tricky at the hotel, so enjoyed our leisurely walk through the town, which was surprisingly buzzing for a Wednesday night, and enjoyed the atmosphere. Both of us said we should come to Christchurch more often, and I think a revisit to the Kings Arms very likely indeed. You can also stay at the hotel, a good idea if you have been overindulging or celebrating a special occasion. Expect to pay around £110-£125 per couple per night for B&B, but there are often offers available if you dine.